Thick Bang / Fringe with long sides. 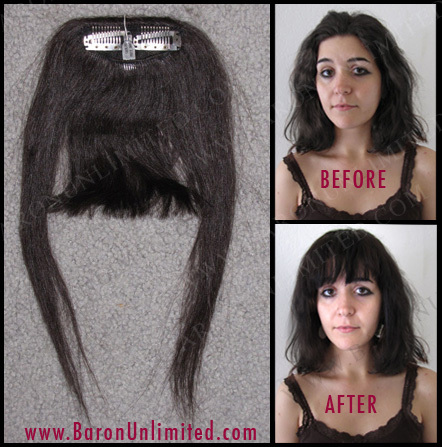 100% HUMAN HAIR Add on bangs / fringes. It can be tinted, toned or streaked with a DARKER color by your hairdresser, but you cannot lighten it. Model is wearing one bang that has been trimmed. You will get one piece on a 3 inch base. Short area is rough cut 6 inches and sides are about 14 inches long. You will need to have them trimmed to fit your face. They can be flat ironed or curled. No returns allowed on human hair products.